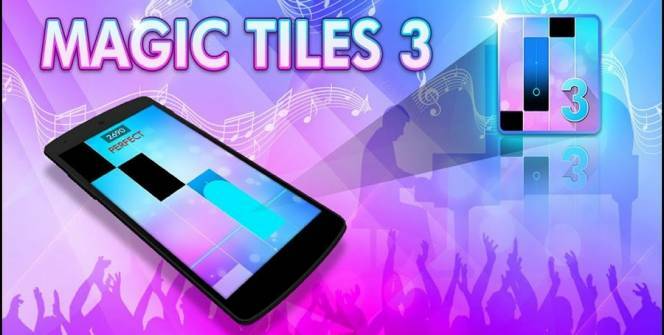 If you’re a fan of mobile piano games or music games, Magic Tiles 3 for PC might be right up your alley. This sequel to the popular Magic Tiles 2 brings a lot of welcome improvements to the series, including a new daily quest system and an improved Battle Mode. Additionally, the game includes more songs than ever before. Gameplay For those of you familiar with Guitar Hero and similar games, the gameplay of Magic Tiles 3 will seem instantly recognizable. Once you start playing a song, black tiles will start scrolling down on your screen; in order to tap them, you will have to hit the corresponding buttons. Some of the more difficult songs will require the player to hold down the tap buttons to play the notes properly. Much like most rhythm games out there, Magic Tiles 3 features an accuracy baseline that measures your playing performance. For every note you hit correctly, you’ll get one of three ratings – cool, great or perfect. In order to beat the challenges the game constantly throws at you, you’ll have to aim for perfection as much as you can. In addition to the standard mode, Magic Tiles 3 also has a Band Mode, which allows you to play around with additional instruments such as guitar, drums and orchestra. Though the core gameplay loop remains essentially the same, the songs can sound vastly different when played with another instrument. If you ever get bored of playing the piano, go ahead and give this mode a try. 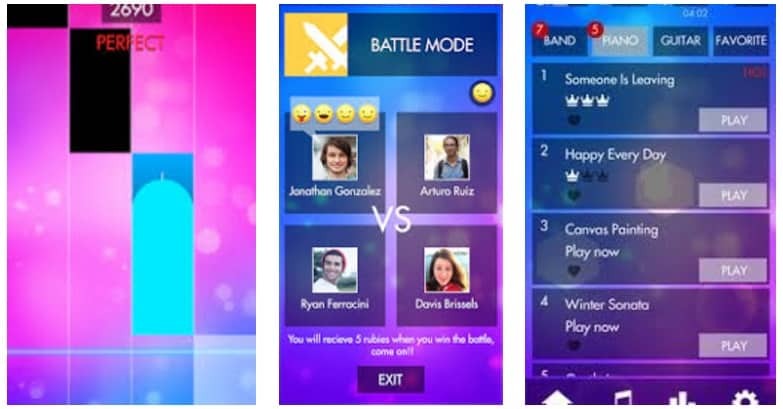 The Battle Mode has played a big part in the success of the previous two Magic Tiles games, and it has only been improved for the latest installment. This mode allows you to compete with other players around the globe, thus doubling up as the game’s main online experience. Defeating your opponents will earn you a certain amount of rubies, which you can use to purchase additional songs. Finally, the Challenge Mode provides a good way to work on increasing your tapping speed. If you’re struggling with some of the game’s more challenging songs, this mode will allow you to increase your skills in a fun and quick way. When compared to its predecessors, Magic Tiles 3 for PC contains a brand-new daily quest system. These quests will allow you to unlock more songs and earn more diamonds, so completing them is usually a good idea. Some of them are quite hard, though, so make sure you’re well prepared. As for the songs themselves, they’re clearly of high quality. The selection of music is mostly oriented towards pop-rock, but the game contains something for everyone’s taste buds. The controls are tight and responsive, and you will never get the impression that you’re fighting the interface in order to do what you want. Magic Tiles 3 is free to download, and it allows you to share its data on multiple devices by logging into your Facebook account. Though the game is challenging, it’s also fair and ultimately rewarding. If you’ve always wanted to be a pianist, Magic Tiles 3 for PC can help you turn those dreams into reality. Sometimes when playing Magic Tiles 3, bluestacks ask you fee to pay but gives you option to download some apps. Every time it asks you just select “Install apps” and continue using it free. I hope you enjoyed this article, please rate and share. If you have problems running Magic Tiles 3 on your desktop or any other issues, leave a comment below.